BUILDER'S WATERFRONT MODEL HOME! SINGLE FAMILY DETACHED HOME ON THE INTRACOASTAL WATERWAY. BEAUTIFUL GATED, MAINTENANCE FREE COMMUNITY WITH AN EMPHASIS ON OUTDOOR LIVING. ENJOY SPECTACULAR WATER VIEWS FROM THE KITCHEN, FAMILY ROOM & MASTER BEDRM. BRING YOUR BOAT TO YOUR PRIVATE PIER, DOCK & LIFT! ENJOY THE OUTDOORS WITH A REAR COVERED PORCH, DECK & BACKYARD HAVEN WITH PAVER PATIO, OUTDOOR KITCHEN & GAS FIRE PIT WITH SEATING WALL. THE LYNNHAVEN IS AN OPEN FLOOR PLAN WITH A 1ST FLOOR MASTER SUITE & ADDITIONAL 1ST FLOOR BEDRM THAT IS PERFECT AS AN OFFICE. 2 BEDROOMS UPSTAIRS WITH A LOFT & JACK-N-JILL BATHRM. SPACIOUS WALK-IN ATTIC. 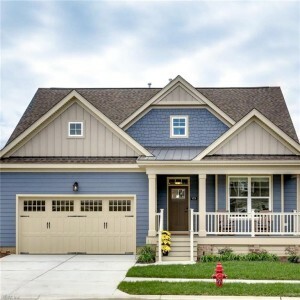 UPGRADED FEATURES INCLUDE HAND SCRAPED HICKORY WOOD FLOORS, QUARTZ COUNTERS IN THE KITCHEN & MASTER BATHRM, CUSTOM TILE & A CRAFTSMAN TRIM PACKAGE WITH WAINSCOTING, TRANSOM OPENINGS & CRAFTSMAN DOORS. COMMUNITY AMENITIES INCLUDE A PAVILION, PIER, BOAT SLIPS, CANOE/KAYAK LAUNCH, PICNIC AREA, POOL & CLUBHOUSE WITH FITNESS CENTER. NO FLOOD INSURANCE REQUIRED. Send me more information about the listing at 173 Tranquility, Chesapeake, VA 23320, MLS# 10252817. This 4 bedroom, 3 bathroom home located at 173 Tranquility, Chesapeake, VA 23320 has approximately 2,598 square feet. It is currently listed for 814900.00 and has a price per sqft of $31,366. This home is currently Active under the MLS#: 10252817. It is listed by Rose & Womble Realty Company. 173 Tranquility, Chesapeake was built in 2016. It has Garage Att 2 Car, Driveway Spc parking. The kitchen includes Dishwasher, Disposal, Dryer Hookup, Microwave, Elec Range, Refrigerator, Washer Hookup. 173 Tranquility is part of the Riverview At The Preserve neighborhood located in 23320.